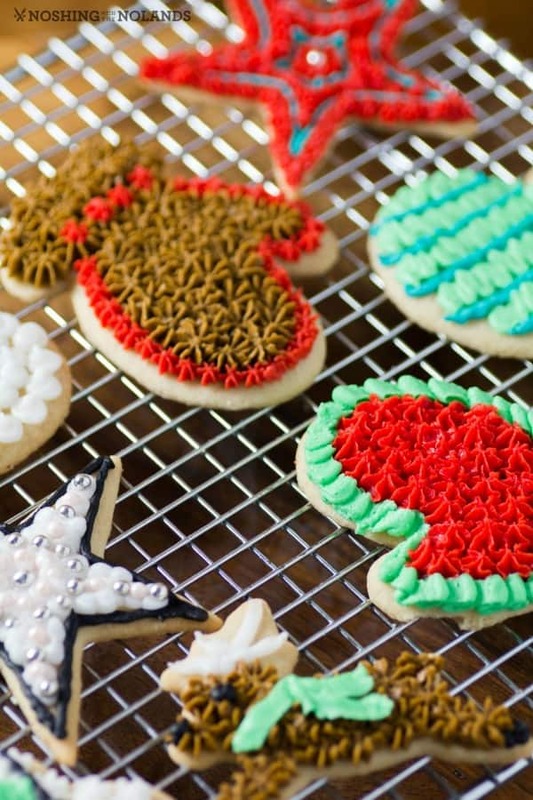 Sugar cookies are fantastic for any season, so versatile of course. They are whatever you cut them out to be and I have done them for all seasons. Today we have Christmas Sugar Cookies and they have been all of Amber’s efforts to cut out, bake and decorate. In my opinion she has done an amazing job!! The key to success is having everything at the ready. The sugar cookies can be made ahead of time and placed in the freezer. So when you have an afternoon to decorate they are ready for you. Children find this a fun and rewarding activity, as they get to eat the fruit of their labor. 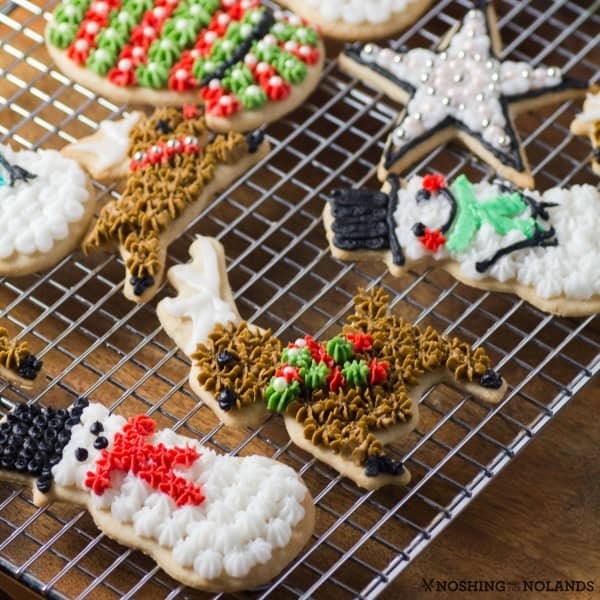 Having a bunch of decorating tips available helps to design the cookies and make it fun. Sprinkles, dragees, colored sugars, eyes, decorations also add to the enjoyment. All of these can be found at your local craft store. As for the decorating techniques you can go for as easy or as complicated as you wish. Simply icing the cookie with a spreader and adding embellishments works or piping in details intricately is also fun! Cookies can be very individual, not one turns out the same. The number one thing is to have fun and be creative. The sky is the limit to what you can do. For these Christmas Sugar Cookies we used a buttercream icing. Dividing up the icing into bowls we created the colors we wanted, and then put the icing into piping bags fixed with a variety of tips. Smaller the tips the better for details. Besides the buttercream icing we also used store bought icing to get that white as white and black as black color which is very hard or impossible with buttercream icing made at home. Set the kids up and let them have some Christmas fun! Doing this at a party can work too. The kids are entertained and the parents can enjoy themselves too. As time went on the decorating got to be more detailed. Amber so enjoyed this activity and when company came over her friend Megan also joined in. Warning: This recipe makes a lot of sugar cookies, it is not for the faint of heart. Decorating sugar cookies is labor intensive and messy but oh so enjoyable too. For this recipe I also made Snowflake Cookies. You can easily cut this recipe in half. I am not sure how many it makes as it all depends on the size of cookie cut out. For the sugar cookies, in a stand up mixer cream butter and sugars together and then beat in eggs until well mixed. Add vanilla and syrup and mix well. Whisk together dry ingredients and add slowly, mixing well until all is incorporated. Chill the dough well, best if done overnight. Roll out dough onto a well floured surface and cut into various shapes. Bake at 325F for 8-10 min. on a lightly greased cookie sheet. Let cool 5 min. on the tray and then remove to further cool on a cooling rack. For the icing I am going to direct you to The Creative Bite as she has an amazing Perfect Piping Buttercream Recipe that we used for this recipe. 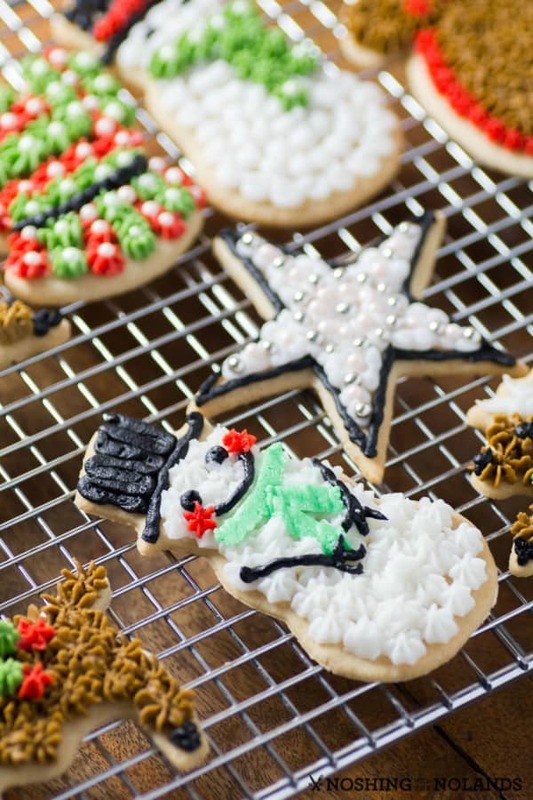 Have fun decorating using additional items like sprinkles, dragees and other decorations if desired. I love it! 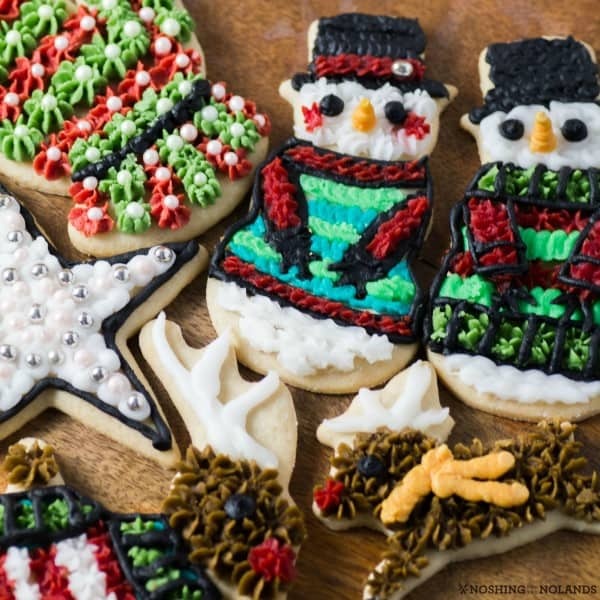 We love baking sugar cookies and decorating them. It is a tradition here! We will try these this year! Those look delicious. I love sugar cookies, especially when they’re frosted. There’s nothing better! I am a fan of sugar cookies. I just cannot resist adorables ones like this with a lot of icing. I love the cookie decorations! We’re actually going to be making some sugar cookies tomorrow to give to our downstairs neighbors for Christmas. Those look so cute. You did such a great job! I love making sugar cookies this time of year. My girls love to help out with baking and decorating them too. These cookies are so cute. I will have to try making some this week. They will be perfect for my cookie exchange. These look amazing. I would love to make some that look like this. I bet they will be a big hit. I will have to get the kids to help me decorate them. This looks like a great sugar cookie recipe. I am excited to give ti a try. I will have to add this to my bake list for this week. One of my biggest wishes is to make cookies like this! i will give your recipe a try this week! Those are the most cutest sugar cookies I have ever seen! Great recipe! I always make sugar cookies for the holidays! Great decorating job! They are so adorable, almost too cute to eat! Sugar cookies are my most favorite holiday cookie! These are gorgeous! Wow, those look professional! There is nothing tastier than a delicious sugar cookie! Your Christmas cookies are so artistic. And I have no doubt they are just as good to eat! Thanks for sharing so many closeups of your handiwork. These cookies are really amazing! Love how you decorate them! SO festive! These cookies are so cute! I wish I had a more decorative hand like this to make some like it. I love Christmas sugar cookies. Making them with the kids is so much fun and seeing what they come up with is awesome. These are such beautiful sugar cookies! My kids and i love making them for the holidays!